After seven podiums without a win Kathrin Zettel, then experienced, lift off on her Olympic season with two victories in one weekend: the giant slalom and the slalom at Maribor. At 23 the Austrian is ripe to harvest gold at Vancouver where she will take part in her favoured giant slalom and the slalom and super-combined, in which she was crowned world champion in 2009. As with many young Austrians, Zettel grew up on a varied practice regime which gave her exposure to all the Alpine races. Slalom gold medallist and combined silver medallist at the junior world championships at Maribor in 2004, she reversed those medals at the same event in 2005 before this rising star made her World Cup debut the following month. At the heart of a multi-talented team she soon began to establish herself grabbing podium spots on the circuit and even getting a fourth place in the slalom at the 2005 world championships. She was still very much on the young side at Turin 2006 she took fourth in the combined and seventh in the giant at just 19-years-old. At the start of the following season came the proud moment where she won her first World Cup race, a giant slalom at Aspen some three months after her 20th birthday, in November 2006. 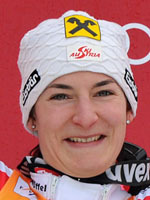 Her 2007 worlds were neither hot nor cold as she took fifth in the slalom and ninth in the giant. A month later though came her first serious injury, she was airlifted unconscious from the Treviso piste where she badly hurt a knee coming off the course of a super-G run and bursting through a security net. She was back in action within three months but had to wait over a year to hit top form again with a string of World Cup wins which saw her come second in the giant slalom rankings. A first major title eventually came her way in February 2009 with triumph in the super-combined at Val-d'Isère world championships, where however she could only manage sixth in her beloved giant. By this time the affable girl with the glasses and the constantly changing hair-colour was well established in the Austrian team. Hard to think that a few years earlier she had been lodged at the hotel of former skier Thomas Sykora (1988 slalom bronze) where she was a trainee hotelier and cook. By this time Sykora was both her agent and mentor. At Vancouver, Zettel will be the woman to beat in the giant slalom, is a good outside bet for the slalom itself and is edging toward a first crystal globe.